Ever since Hunger Games came out, I have been really into the dystopian themed books. Books about a fallen society and a hero who overcomes a higher power is pretty exciting to me. 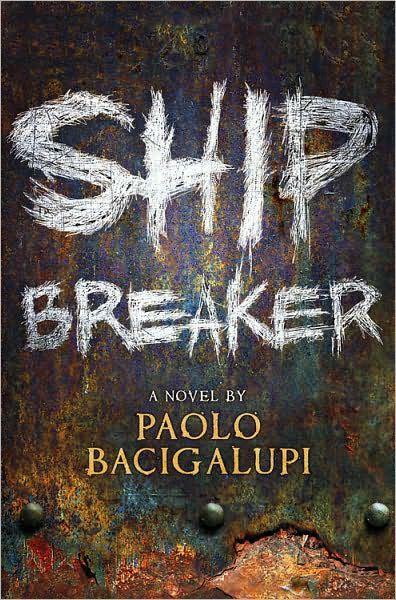 The next set of books I read were Printz Winners, and I was excited to see that Ship Breaker, a book about a dystopian future, was one of the choices. It took me a couple chapters to fully understand the job and the living conditions of the characters. I knew they were children, they were working in ships, it was a dangerous job, and their lives are molded around superstitions and survival. Nailer, the main character gets the nickname “Lucky Boy” after barely escaping death trying to pull copper from a ship. His luck continues when he finds a wrecked ship that belonged to “swanks” or upper class people. They assumed no one survived the ship wreck and then they came across a beautiful dark haired girl trapped between furniture. It wasn’t until they tried scavenging her jewelry, that they realized she was still alive. Nailer’s lucky conscience wouldn’t let him leave her, so he took her, nursed her back to health and then made a deal with her. Both were forced to trust in a world where they grew up trusting no one. The rest of the novel takes you through exciting adventures, traveling through a highly polluted and broken America. In the end Nailer discovers who he is and gains a better life. I can see why this powerful novel was a Printz Winner.